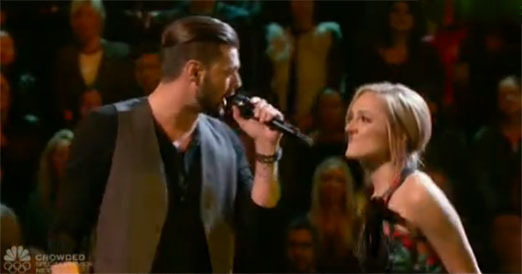 Justin Whisnant and Mary Sarah from Team Blake sings ‘Louisiana Woman, Mississippi Man’ on The Voice Season 10 Battle Rounds, Tuesday, March 15, 2016. “Justin, you are pretty accurate the whole way through. Mary, your high notes are really nice. You are two different king of singers,” said Christina AGuilera. “Justin, your vibrato was colorful. Mary, I like you showmanship,” said Pharrell Williams. “Justin, you have a great voice, you are a great singer. Mary, same thing but it took a minute to warm up,” said Adam Levine. “Im happy and proud for both of you for stepping into a big shoes. Justin, you showed depth. Mary, I now see you as a performer,” said Blake Shelton. The winner of this battle is Mary Sarah. No steal for Justin Whisnant. Watch their performance on the video below.